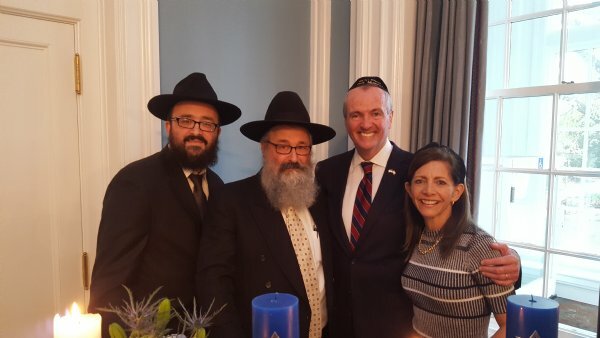 The Governor of New Jersey, Phil Murphy, officially began the Chanukah Celebrations with 100 Jewish leaders at Drumthwacket,N.J., the official residence of the state’s Governor, today December, 2, 2018. The Governor and First Lady Tammy, participated in the Pre- Chanukah Lighting Ceremony, during which all participants sang a Chanukah song and enjoyed the meaningful event. 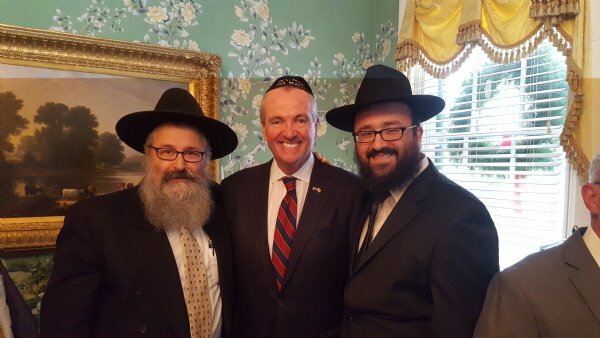 Governor Murphy was emotional as he spoke of the Menorah being lit. The Menorah was brought to America by the father of N.J. Assemblyman Gary Schaer, the only Shomer Shabbat person serving in the New Jersey Legislature. The Menorah has served proudly in the Schaer Family for more than 100-years, and represented the victory of light over darkness. Thus, this was a very moving experience for all in attendance. During the ceremony, Israeli Ambassador Dani Dayan spoke about the Governor’s friendship and dedication to Israel, and the Governor remarked that he was proud to be an ‘honorary Jew’ in this Chanukah. 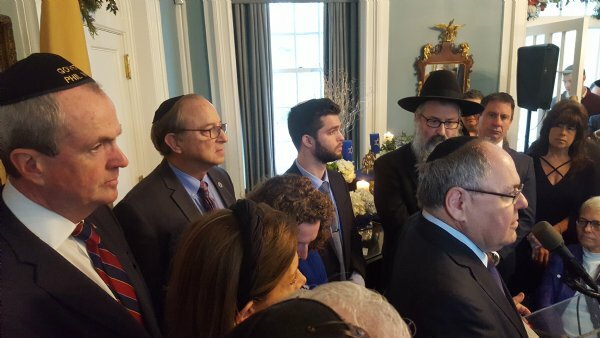 The Governor’s Pre-Chanukah Program was attended by many community leaders and rabbis from throughout New Jersey, including Chabad Rabbis Yosef Carlebach and Mendy Carlebach of Chabad House at Rutgers University. Pictured below are Governor and Mrs Murphy and Rabbi Yosef Carlebach and Rabbi Mendy Carlebach.